The Supreme Court dismissed Nawaz Sharif as prime minister 28 Juoy 2017 after an investigation into his family could not account for its vast wealth. Sharif and his family were embroiled in a long-running case that gripped the country following the release of the Panama Papers. Domestic media reported a criminal investigation would also be launched against the premier and his family. "He is no more eligible to be an honest member of the parliament, and he ceases to be holding the office of prime minister," Judge Ejaz Afzal Khan said in court. Sharif resigned from his position shortly after the Supreme Court decision, the prime minister's office announced. His resignation meant the federal cabinet has been dissolved. The statement issued by the office said Sharif had "stepped down" despite having "serious reservations" about the judicial process. Sharif's ruling Pakistan Muslim League-Nawaz (PML-N) party, which has a majority in parliament, is expected to name a new prime minister to hold office until elections due in 2018. Among allies mooted to replace Sharif were Defence Minister Asif Khawaja, Planning Minister Ahsan Iqbal and Petroleum Minister Shahid Abbasi. Sharif chaired an emergency meeting of his Pakistan Muslim League-N party in Islamabad, where leaders selected former petroleum minister Shahid Khaqan Abbasi as his successor for a short term of 45 days. Abbasi still must pass a vote of confidence by the parliament before assuming office. Sharif's younger brother, Shahbaz Sharif, would run in a parliamentary election for the seat vacated by the ousted prime minister so he could become a member of the national parliament and potentially take over as permanent prime minister of Pakistan. The ruling by the five-judge court was not surprising as many legal experts and opposition leaders were expecting punitive measures against Sharif and his family. It was not the first time the judiciary has ordered the dismissal of the elected prime minister. In 2012, the court convicted the then-premier Yusuf Raza Gilani in a contempt case, forcing him to step down. Sharif's two previous stints in power were also cut short, including by a military coup in 1999. But he came back from exile to win a resounding victory in the 2013 general elections. Sharif's ouster was seen as a major victory for PTI leader Imran Khan, the cricketer-turned-politician who led street protests to demand an investigation into Sharif. Khan pounced on the leaking of the Panama Papers, which revealed Sharif's family had bought posh London apartments through offshore companies. The Supreme Court ruled in April there was insufficient evidence to remove Sharif from office - by a 2-3 verdict - but it ordered a probe by an investigative panel that included members of the military intelligence agencies. The Joint Investigation Team (JIT) returned its findings in a 254-page report that said Sharif's family assets do not match their earnings. The panel also accused his children, including daughter Maryam, of signing forged documents to obscure ownership of the London flats. Muhammad Nawaz Sharif was born in Lahore on December 25, 1949. He is the eldest son of Muhammad Sharif, a joint owner of the Ittefaq Group of Industries. Nawaz Sharif got his schooling from Saint Anthony's High School. After graduating from Government College Lahore, he obtained his Law Degree from the Punjab University. Nawaz Sharif remained a member of the Punjab Provincial Council for some time. He joined the Punjab Cabinet as Finance Minister in 1981. He was able to raise the allocation of funds for the development of rural areas to 70 percent of the Annual Development Program in the Province. He also held the portfolio of Sports and was able to reorganize the sports activities in the Province. In the general elections of 1985, Nawaz Sharif won with an overwhelming majority, both in the National and Provincial Assemblies. On April 9, 1985, he was sworn-in as Chief Minister of Punjab. On May 31, 1988, he was appointed caretaker Chief Minister, after the dismissal of Assemblies by General Zia. Nawaz Sharif was again elected as Chief Minister after the 1988 general elections. A massive uplift of Murree and Kahuta was undertaken during his term as Chief Minister of Punjab. Nawaz Sharif was Zia ul-Haqq's boy, a tool of the Islamic old guard. The Islami Jamhoori Ittehad (Islamic Democratic Alliance or IJI) was formed in September 1988 to oppose the Pakistan's People Party (PPP) in elections that year. The alliance comprised nine parties, of which the major components were the PML and the Islamic Organization (Jamaat-i-Islami or JI). The IJI won only fifty-three seats in the National Assembly, compared with ninety-two won by the PPP. Most IJI seats were won in Punjab. Nawaz Sharif emerged from the 1988 elections as the most powerful politician outside the PPP. In December 1988, he succeeded in forming an IJI administration in Punjab and became the province's chief minister. It was from this power base that he waged the political battles that eventually led to his becoming prime minister in 1990. In the supercharged atmosphere of the 1990 elections, the electorate surprised observers. Neither the IJI nor the PPP was expected to come up with a firm mandate to rule. Yet the IJI received a strong mandate to govern, winning 105 seats versus forty-five seats for the Pakistan Democratic Alliance (PDA), of which the PPP was the main component in the National Assembly. New elections, held in October 1990, confirmed the political ascendancy of the IJI. In addition to a two-thirds majority in the National Assembly, the alliance acquired control of all four provincial parliaments and enjoyed the support of the military and of President Khan. 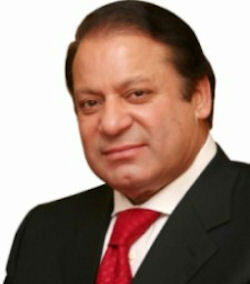 Muhammad Nawaz Sharif, as leader of the PML, the most prominent Party in the IJI, was elected prime minister by the National Assembly. On November 6, 1990, Nawaz Sharif was sworn-in as Prime Minister of the country, after his alliance, I.J.I. won the October 1990 elections. The passage into law in May 1991 of a Shari'a bill, providing for widespread Islamization, legitimized the IJI government among much of Pakistani society. Nawaz Sharif was not able to reconcile the different objectives of the IJI's constituent parties. The largest religious party, Jamaat-i-Islami (JI), abandoned the alliance because of its perception of PML hegemony. The regime was weakened further by the military's suppression of the MQM, which had entered into a coalition with the IJI to contain PPP influence and allegations of corruption directed at Nawaz Sharif. In 1993 a protracted power struggle between Prime Minister Nawaz Sharif and President Ishaq Khan played out as Pakistan's two leading politicians maneuvered each other out of power. This period of behind-the-scenes struggle was described by a Pakistani daily as a "Silent Revolution" and was watched with some concern by the international community, which feared that Pakistan could once again fall under military rule. After Muhammad Khan Junejo, who had led the Pakistan Muslim League (as the PML-Junejo or PML-J) died in March 1993, Mian Nawaz Sharif took over the party and it became the Pakistan Muslim League-Nawaz or PML (N) for Nawaz Sharif. The death of Junejo signified the end to an uneasy coalition that had existed between the feudal lobby under Junejo and the representatives of the new industrialist classes who, under the guidance of Nawaz Sharif, were running the Islamic Democratic Alliance (Islami Jamhoori Ittehad--IJI) government of 1990-93. On 18 April 1993, the power struggle seemed to be resolved when President Ishaq Khan, exercising the extraordinary constitutional powers afforded the president by the Eighth Amendment, dismissed the government of Prime Minister Nawaz Sharif. For the second time, Ishaq Khan had invoked the Eighth Amendment to bring down an elected government. The charges of corruption and mismanagement of the economy that he leveled against Nawaz Sharif were almost identical to those he had earlier brought against Benazir in 1990. President Ishaq Khan appointed Balakh Sher Mazari, described by the New York Times as heading "a tribal clan of landowners," as caretaker prime minister and announced a new timetable for elections. On 26 May 1993, the Supreme Court voted that Ishaq Khan's dissolution of the National Assembly and his dismissal of the prime minister were unconstitutional. The Supreme Court's action was a sharp rebuke of Ishaq Khan's heavy-handed exercise of presidential powers and was widely hailed as a victory for the advocates of democratization. Yet, although the Supreme Court was able to reinstate the Nawaz Sharif government, the status quo ante was not restored, and the struggle between the president and the prime minister continued unabated, making the pursuit of regular government workings impossible. Noting the mounting impatience of the Pakistani military with the endless machinations of the country's politicians, the United States and the European Community communicated their concern, warning against a military takeover. The continuing political crisis in Pakistan came to an abrupt halt when the prime minister and president both resigned after two weeks of intense negotiations among the Nawaz Sharif government, Benazir, and the army. The resolution of the crisis was unique because for the first time in the nation's history a government had voluntarily stepped down in order to avoid a possible military intervention. Interestingly, the negotiations had been mediated by General Waheed, the chief of the army staff. During his tenure as the Prime Minister, efforts were made to strengthen the industries with the help of private sector. Projects like Ghazi Brotha and Gawadar Miniport were initiated. Land was distributed among landless peasants in Sindh. Relations with the Central Asian Muslim Republics were strengthened and E. C. O. was given a boost. In an attempt to end the Afghan crisis, the "Islamabad Accord" was reached between various Afghan factions. His most important contribution was economic progress despite American sanctions on Pakistan through the Pressler Amendment. The resultant agreement and its implementation followed strict constitutional procedure. Ishaq Khan was replaced by the chairman of the Senate, Wasim Sajjad, who functioned as acting president until the elections. More important, Moeen Qureshi, a former civil servant and senior World Bank (see Glossary) official, agreed to serve as caretaker prime minister. Qureshi, a Pakistani national, had left the World Bank in 1992, obtained permanent residence status in the United States, and established his own company, Emerging Markets Corporation. In the October 1993 elections, the PPP won a plurality of seats in the National Assembly, and Benazir Bhutto was asked to form a government. However, because it did not acquire a majority in the National Assembly, the PPP's control of the government depended upon the continued support of numerous independent parties, particularly the PML/J. The unfavorable circumstances surrounding PPP rule, the imperative of preserving a coalition government, the formidable opposition of Nawaz Sharif's PML/N movement, and the insecure provincial administrations, presented significant difficulties for the government of Prime Minister Bhutto. In November 1996, President Leghari dismissed the Bhutto government, charging it with corruption, mismanagement of the economy, and implication in extrajudicial killings in Karachi. Elections in February 1997 resulted in an overwhelming victory for the PML/Nawaz, and President Leghari called upon Nawaz Sharif to form a government. Mian Nawaz Sharif was re-elected as Prime Minister with an overwhelming majority. On October 12, 1999, the civilian Government headed by Nawaz Sharif was overthrown by a military coup. On 14 October 1999, General Pervez Musharraf, Army Chief of Staff, declared a state of emergency and issued the Provisional Constitutional Order (PCO), which suspended the federal and provincial Parliaments, held the Constitution in abeyance, and designated Musharraf as Chief Executive. Following the 12 October 1999 ouster of the government of Prime Minister Sharif, the military-led government stated its intention to restructure the political and electoral systems. Musharraf officially became head of the Pakistani state on 20 June 2001. Seeking to ease international concern about the nature of his regime and rise to power, Musharraf sought to put Nawaz Sharif, and six others, on trial for attempted murder and hijacking in relation to the October coup. The charges were centered around the allegation that Sharif had ordered landing rights denied to a plane carrying Musharraf and 200 other people, said to have been dangerously low on fuel. Military forces eventually took control of the Karachi airport and allowed the plane to land, an event followed just hours later by the completion of the coup. The charges also alleged that Sharif had attempt to collect men and arms in preparation for a counter coup and had sought to kill Musharraf. Sharif was convicted in April 2000 and sentenced to life in prison. By May he was put on trial again by the Musharraf government on charges of corruption. In July he was convicted on charges of tax evasion. Sharif's legal defense team boycotted these trails on numerous occasions in protest of the fairness of the proceedings. In December 2000, Sharif went into self-imposed exile in Saudi Arabia. In April 2005, after reports suggesting a partial thaw with former prime minister's in exile Benazir Bhutto and Nawaz Sharif, the husband of Benazir Bhutto was arrested reentering Pakistan. This particular arrest was one of a number labeled as a serious crackdown on the political opposition during the month. Protests came not only from political and religious moderates, but also from religious extremists and their political entities, who continued to challenge Musharraf's alliance with the United States and policies against Islamic oriented militants in Pakistan's tribal border regions. Political opponents were incensed at reports in May 2005 that Musharraf was contemplating staying in power after his term came up in 2007. In August 2007 Nawaz Sharif returned from exile to contest planned elections eventually held in February 2008. The PML (N) emerged from those elections with the second highest number of MPs, behind the People's Party of Pakistan, both of whom looked to form a coalition to challange pro-Musharraf parties. On 12 May 2008, Nawaz Sharif announced that the PML-N was leaving the government headed by the PPP, because of differences over the handling of supreme court justices sacked by President Musharraf during 2007. Sharif and PML-N advocated for the reinstatement of the justices with their previously held powers, while the PPP had been advocating a compromise between various political groups that would see their return, but with less authority than they had previously. On 26 May 2009, the Supreme Court reversed its February 25 decision and declared both Nawaz and Shahbaz Sharif eligible to run for and serve in public office. This sealed the final reinstatement of Shahbaz Sharif as Chief Minister of Punjab and cleared the way for Nawaz to run (and win within 20-30 days) a by-election in Lahore for a seat in the National Assembly. Nawaz's return to the national stage marked the beginning of Nawaz's efforts to again become Prime Minister. Sharif went on to regain his former post as prime minister in 2013. His ascension to an unprecedented third term came after strong support among rural voters and the religious community spurred his party to a decisive parliamentary election victory. Since his return as prime minister, Nawaz Sharif emerged as an unlikely standard-bearer for reform. Sharif and his Pakistan Muslim League Nawaz (PML-N) party, which has strong support among conservatives, surprised many observers by confronting the powerful religious establishment and calling for a more tolerant Pakistan. Since the beginning of 2016, the 66-year-old enacted a landmark domestic violence bill, promised a tougher stance on so-called honor killings, officially recognized holidays celebrated by Pakistan's religious minorities, and overseen the execution of a man revered by hard-line clerics. The change of course was due to the prime minister's ambitious plans to overhaul the economy and his easing relationship with the country's powerful army, which has an oversized role in domestic and foreign affairs. On April 4, 2016 the leaked Panama Papers showed the involvement of Sharif's family in offshore companies including two used to buy luxury homes in London. On 28 October 2016 Cricketer-turned-politician Imran Khan threatened to paralyse the capital, Islamabad, with a "lockdown" of street protests unless demands for an independent investigation into the Panama revelations are met. Sharif denies any wrongdoing. On 02 November 2016 the Supreme Court agreed to set up a judicial commission to probe corruption allegations against Sharif, stemming from Panama Papers leaks. Khan backed down from lockdown threat. On 28 July 2017 the Supreme Court declared Sharif disqualified from office for not declaring income from a company in United Arab Emirates, which was not in original Panama Papers revelations. Sharif was disqualified from office by the Supreme Court, which declared him "dishonest" for not disclosing a separate monthly income from a company owned by his son. The court also ordered the National Accountability Bureau (NAB) to open a criminal trial into ownership of the London flats along with several other Panama Papers revelations. On 13 April 2018 the Supreme Court further rules Sharif was banned from political office for life. Pakistan's anti-corruption court on 06 July 2018 convicted ousted Prime Minister Nawaz Sharif in absentia and sentenced him to 10 years in prison, in what seemed to be the end of a long and tumultuous political career of the three-time leader. Sharif was convicted after failing to prove a legal source of income for buying several luxury flats in the 1990s. His daughter Maryam was also convicted and sentenced to seven years in prison. Nawaz was in London at the time, where his wife was receiving cancer treatment, but returned to Pakistan 14 July 2018 days ahead of the election, only to be arrested and imprisoned on arrival. Their return represented a high-stakes gamble to shake up an election race riven by accusations Pakistan’s powerful military is working behind the scenes to skew the contest in favor of ex-cricket hero Imran Khan, who describes Sharif as a “criminal” who deserved no support. Nawaz was released in September pending an appeal. Nawaz Sharif was sentenced to seven years in prison for corruption 24 December 2019, the latest conviction in a series of allegations which saw him ousted from power last year. This conviction, centered on family businesses in the Middle East, was his second stemming from a corruption investigation spurred by the Panama Papers leak, and came as new Prime Minister Imran Khan has vowed to tackle endemic graft in Pakistan. The anti-corruption court said in its ruling that Nawaz was unable to prove the source of income that led to his ownership of a steel mill in Saudi Arabia. He was taken into custody and sent to a prison in Lahore, and was also fined 1.5 billion rupees ($10.8 million). Sharif, a three-time prime minister, has denied all the charges against him and claims he is being targeted by the country's powerful security establishment.